Our range of products offers various options for detection of a given label. To select the desired visualization method, choose the reagent according to the label being detected. Then choose the complementary visualization reagents, either fluorescence or enzyme-based, from the lists on the following pages. All antibodies to the labels are affinity-purified and are ideal for detecting labeled probes in such applications as in situ hybridization (please see pages 22-25 for protocols) or northern and Southern blotting (please see pages 20-21 for protocol). Biotin - Because of the many biotin-avidin/streptavidin systems available, this label is ideal for a variety of applications including in situ hybridization, blotting, and affinity binding. DNP (Dinitrophenyl) - Because DNP is not found endogenously in tissue, it is an excellent alternative label to biotin. High affinity, purified antibodies are available for detection or amplification of the signal. Fluorescein - This fluorescent label can be directly detected or used as a hapten and detected with any of our high affinity antibody reagents. (Excitation maximum at 495 nm; emission maximum at 515 nm). Fucose - This unique label is ideal for reversible binding of labeled nucleic acid to the matrix, VECTREX® AAL. Fucose labeled nucleic acids can be bound and eluted under mild conditions. (For more information, please see page 17). Alkaline phosphatase Aleuria aurantia lectin can be used in dot blot applications to assess labeling efficiency with the fucose label. Texas Red® - This fluorescent label is a rhodamine derivative that can be directly visualized. The label can also be detected, and the signal amplified using our affinity-purified antibody conjugates to rhodamine. (Excitation maximum at 595 nm; emission maximum at 615 nm). The following fluorescent detection reagents are ideal for applications such as fluorescence in situ hybridization. Biotinylated Anti-Avidin D5, 18, 29 and Biotinylated Anti-Streptavidin56 are effectively used for amplifying fluorescent signals in biotinavidin/streptavidin systems (please see page 22 for protocol). After choosing a fluorescent detection method, choose one of the VECTASHIELD® mounting media on page 12 for mounting and coverslipping. VECTASHIELD® mounting media are unsurpassed in preserving and preventing the fading of fluorescently labeled sections, cells or spreads. Coherent anti-Stokes Raman scattering (CARS) and two-photon fluorescence (TPF) imaging of fluorescein-labeled HCV RNA inside Huh-7 cells. HCV RNA in-vitro transcripts were labeled with a fluorescein-maleimide label (SP-1502) using the 5’ EndTag™ Nucleic Acid Labeling System. 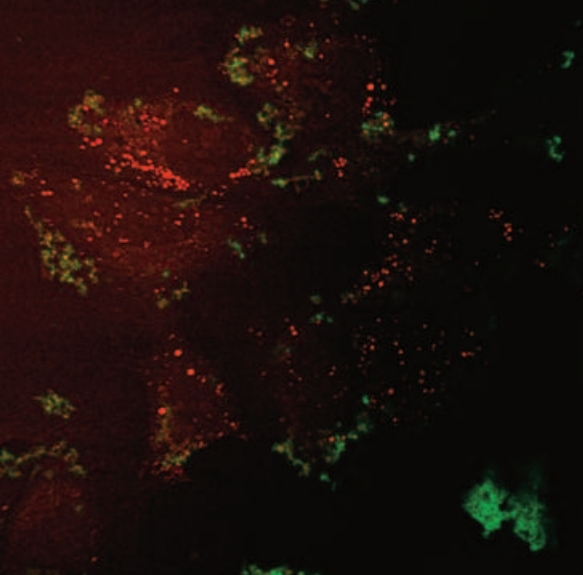 Huh-7 cells were transfected with 3 µg of 5’-fluorescein-labeled HCV RNA and imaged at 4 h posttransfection. Top: CARS and TPF of Mock transfected Huh-7 cells. Bottom: CARS and TPF of Huh-7 cells transfected with fluorescein-labeled HCV RNA. Figure courtesy of Jennifer Haley, Sylvie Belanger, Adrian Pegoraro, Albert Stolow, and John P. Pezacki, The Steacie Institute for Molecular Sciences, The National Research Council of Canada. Unpublished data. Fluorescence in situ hybridization of human chromosomes using FastTag® Fluorescein-labeled pHuR 98 detected with Biotinylated Anti-Fluorescein and Fluorescein Avidin DCS, and FastTag® Texas Red® - labeled pUC1.77 directly detected. Counterstained and mounted with VECTASHIELD® with DAPI. VECTASHIELD® Mounting Media are unsurpassed in preventing the rapid loss of fluorescence during microscopic examination. The different formulations of VECTASHIELD® Mounting Media all offer the same outstanding anti-fade and anti-photobleaching properties. They are all compatible with fluorescein, Texas Red®, AMCA and a wide variety of other fluorochromes. Different formulations are available to best suit the investigators’ priorities and experimental design. The original VECTASHIELD® Mounting Medium is a glycerol-based, aqueous mountant that does not solidify but remains a viscous liquid on the slide. After mounting, coverslipped slides will not readily dry out and can be reviewed for weeks afterwards without sealing. For prolonged storage, coverslips can be permanently sealed around the perimeter with nail polish. VECTASHIELD® Hard✦Set™ Mounting Medium is an aqueous mountant that hardens when allowed to set at room temperature for at least 20 minutes. This facilitates handling of the slide, eliminates the need to secure the coverslip, and is more convenient for use with oil immersion microscopy. Although stained and mounted slides may be stored for several weeks, VECTASHIELD® Hard✦Set™ is not a permanent mounting medium. To remove coverslip and mounting medium, slides can simply be incubated in buffer until the mounting medium is removed. Slides can be remounted in fresh mounting medium. Both the VECTASHIELD® Hard✦Set™ and the original VECTASHIELD® Mounting Media are available with or without the counterstain DAPI (4,6’diamidino- 2-phenylindole; blue). The original VECTASHIELD® Mounting Medium is also available with the counterstain propidium iodide (PI; red). These counterstains are provided at an optimal concentration of 1.5 µg/ml. Lower concentrations can be achieved by dilutions with the appropriate VECTASHIELD® Mounting Medium. 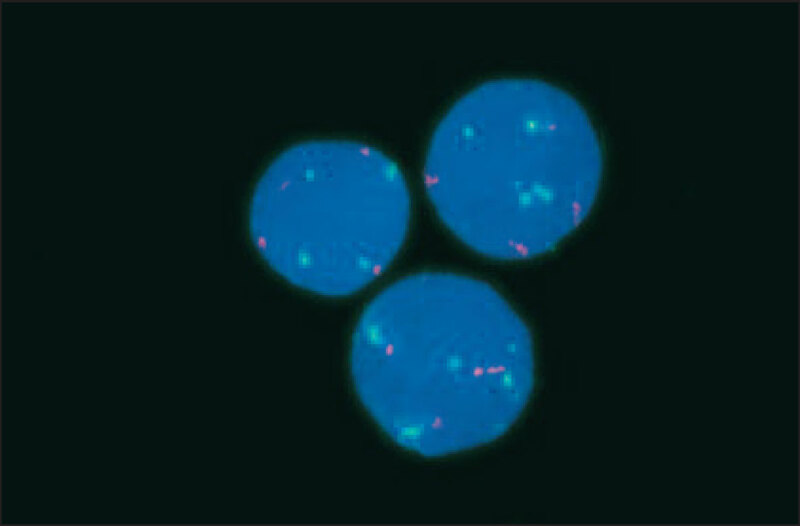 DAPI produces a blue fluorescence when bound to DNA with excitation at about 360 nm and emission at 460 nm. PI has a broad excitation range with a maximum at about 535 nm and emission at about 615 nm when bound to DNA. The reagents in these enzyme substrate kits are supplied as concentrated stock solutions in convenient dropper bottles. All substrates can be used in ISH and blotting applications. BCIP/NBT substrate (blue/violet) is the most sensitive of all the chromogenic substrates because it continues to develop over many hours, darkening with time. Vector® Red is unique. It is chromogenic and fluorescent, and dehydratable. It can be viewed with a fluorescence microscope using a rhodamine or Texas Red® filter. 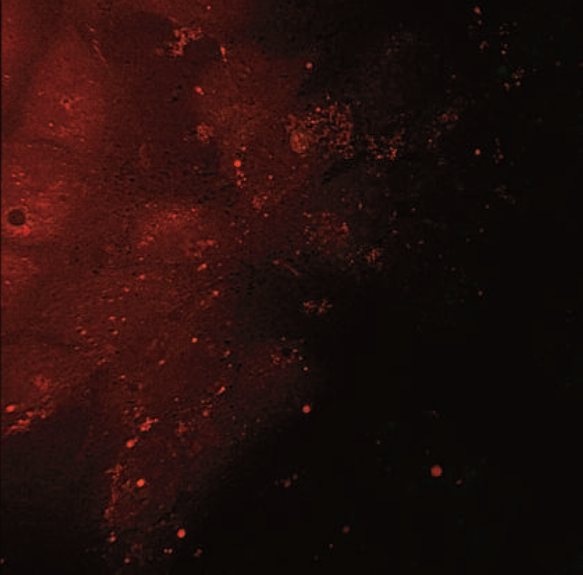 Vector® Red can be used in fluorescent multiple label protocols in combination with fluorochromes like fluorescein and is compatible with fluorescent counterstains like DAPI. Vector® Red can also be used for sequential, multiple label ISH or IHC/ISH because of its stability through ISH procedures. The alkaline phosphatase substrate kits provide sufficient reagents to make approximately 200 ml of working solution. Vector® NovaRED™ (red), Vector® VIP (purple), DAB and DAB/Ni (brown or black), are similar in sensitivity and can be permanently mounted. All produce dense precipitates with crisp localization. ImmPACT™ DAB has these same attributes but is up to four times more sensitive. DAB or ImmPACT™ DAB can be used for multiple label ISH or IHC/ISH because of their stability. TMB is the most sensitive peroxidase substrate, albeit with a more diffuse, less localized reaction product. Each peroxidase substrate kit provides all reagents necessary to prepare approximately 300 ml of working solution. ImmPACT™ DAB provides 120 ml of working solution. DuoLuX™ Chemiluminescent/ Fluorescent Substrate is a unique formula based on acridan chemistry with very high sensitivity, prolonged chemiluminescent light emission, as well as permanent fluorescence. The DuoLuX™ Substrate is available for alkaline phosphatase39, 53, 55 or peroxidase10, 17, 43 and is recommended for blotting applications.16, 25, 48 Sensitivities ranging from 100 fg to 10 pg of nucleic acid can be achieved. The UltraSNAP™ Detection Kit, which includes the DuoLuX™ Substrate, is designed for detection of biotinylated probes in nucleic acid blotting applications (Please see page 14 for details). With either substrate formula, reacted DuoLuX™ substrate luminesces in the blue range with a peak emission at 453 nm. The half-life of luminescent emission exceeds that of other luminescent substrates. The fluorescent signal can be seen visually or captured digitally. 7, 34 The excitation maximum is at 405 nm, but other wavelengths (254 nm and 365 nm) also excite. Maximum fluorescent emission occurs at 453 nm.